Chandigarh, 14th March, 2017: Hyderabad, among Indian cities, ranks as the top Indian city in the quality of living ranking, for the third year in a row, Mercer’s Quality of Living rankings 2017 unveiled today. For the second year in a row, New Delhi continues to be ranked lowest, amongst the surveyed cities, with scores remaining constant. Both Hyderabad and Pune cities rank higher for quality of living than the country’s more traditional business centres, Mumbai and New Delhi ranked at 154 and 161 respectively as per the report. Globally, Vienna occupies first place for overall quality of living for the 8th year running, with the rest of the top-ten list mostly filled by European cities: Zurich is in second place, with Munich (4), Dusseldorf (6), Frankfurt (7), Geneva (8), Copenhagen (9), and Basel, a newcomer to the list, in 10th place. The only non-European cities in the top ten are Auckland (3) and Vancouver (5). The highest ranking cities in Asia and Latin America are Singapore (25) and Montevideo (79), respectively. "The survey highlights that Indian cities that have been part of the survey haven’t made much progress on the quality of living scale since last year “, noted Ruchika Pal, Principal and India Practice Leader, Global Mobility. The only exception is Chennai, whose score has marginally improved mainly on account of public transport, including buses and a recently expanded two-line metro system, and improved availability of expat housing. Hyderabad has slipped five ranks from 139 last year to 144, on account of decreased power supply and water availability. The power supply in Hyderabad is irregular, and voltage changes can be frequent. Most households and businesses use generators to provide a back-up supply. Water availability is occasionally restricted in some areas. In April 2016, the city experienced a severe water crisis due to drought. On the positive side, Hyderabad continues to score high, in comparison with other surveyed Indian cities, on account of lower crime rate- violence is uncommon in Hyderabad and in general, the police force is efficient and reliable. While New Delhi scores well on account of its airport facility, availability of international schools and low probability of natural disasters. These positives are compensated by a variety of negatives including a ‘notorious’ crime rate, air pollution and water availability. “Delhi continues to be challenged with increasing air pollution, contributed by growing traffic and industrialization in the city. Delhi's air is the worst among world megacities, even the World Health Organisation (WHO) confirmed recently. Unfortunately, there has been no improvement in air quality” said Ruchika Pal. Over time, cities like Hyderabad, Pune and Chennai have emerged as cities of choice due to factors such as relatively lower crime rate, lesser air pollution and improved options for international and reputable English speaking schools. 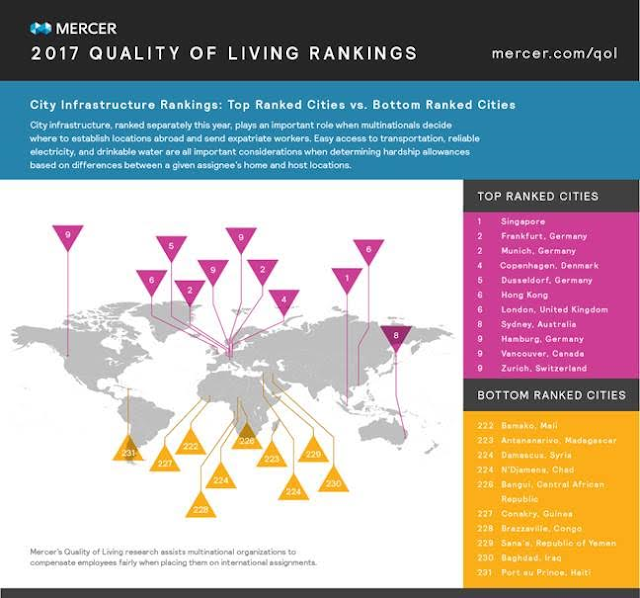 Mercer’s survey also includes a city infrastructure ranking that assesses each city’s supply of electricity, drinking water, telephone and mail services, and public transportation as well as traffic congestion and the range of international flights available from local airports. Singapore tops the city infrastructure ranking, followed by Frankfurt and Munich both in 2nd place. Baghdad (230) and Port au Prince (231) rank last for city infrastructure. Amongst Indian cities, Mumbai is ranked the highest at 141, followed by Kolkata (149) and Pune (151). Bangalore is rated the lowest, amongst the surveyed Indian cities, ranked at 177. In South Asia, the Indian cities fare much better on quality of living compared to Dhaka in Bangladesh (rank 214), and Islamabad (rank 194), Lahore (rank 202) and Karachi (rank 204). Colombo, the capital city of Sri Lanka however has emerged as the top ranker in South Asia, with a score of 132. “Low scores of Indian cities would suggest that inbound expats from 143 of the 231 surveyed cities would qualify to receive a hardship allowance to work in an Indian city. On the other hand, outbound expats from India are expected to grow in USA, UK and UAE. Our data suggests that these outbound expats will experience better quality of living in the cities they move to and therefore may not receive a hardship or quality of living allowance ” added Ruchika Pal, Principal and India Practice Leader, Global Mobility. Globally, Vienna has been rated as the city with the best quality of living for the fourth consecutive time as per Mercer’s Quality of Living rankings 2017. Despite increased political and financial volatility in Europe, many of its cities offer the world’s highest quality of living and remain attractive destinations for expanding business operations and sending expatriates on assignment, according to Mercer’s 19th annual Quality of Living survey. City infrastructure, ranked separately this year, plays an important role when multinationals decide where to establish locations abroad and send expatriate workers. Easy access to transportation, reliable electricity, and drinkable water are all important considerations when determining hardship allowances based on differences between a given assignee’s home and host locations. Mercer’s authoritative survey is one of the world’s most comprehensive, and is conducted annually to enable multinational companies and other employers to compensate employees fairly when placing them on international assignments. Employee incentives include a quality-of-living allowance and a mobility premium. 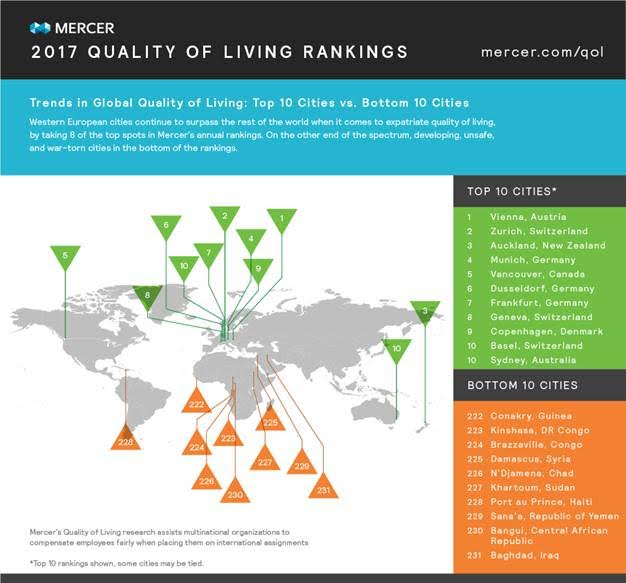 * Mercer’s Quality of Living surveys provide valuable data as well as hardship premium recommendations for over 450 cities throughout the world; this year’s ranking includes 230 of these cities. The parameters taken into account for the survey include political and social environment, medical care and health considerations, public services, recreation facilities and natural environment amongst others. “Economic instability, social unrest, and growing political upheaval all add to the complex challenge multinational companies face when analysing quality of living for their expatriate workforce,” said Ilya Bonic, senior partner and president of Mercer’s Career business. “For multinationals and governments it is vital to have quality of living information that is accurate, detailed, and reliable. It not only enables these employers to compensate employees appropriately, but it also provides a planning benchmark and insights into the often-sensitive operational environment that surrounds their workforce. “In uncertain times, organisations that plan to establish themselves and send staff to a new location should ensure they get a complete picture of the city, including its viability as a business location and its attractiveness to key talent,” Mr Bonic added.